If you want to be able to examine the waveforms produced by this and other projects then get a copy of my book: Sound Card Oscilloscope and build yourself some very capable test gear. You just need 4 jumper wires to connect this up. I used an old piece of ribbon cable that I had lying around. I stripped off the ends, soldered half an inch of solid wire on the end then covered the joint with some sleeving. It works well but it can be very tedious making the cables. By the time I had finished I told myself that I wasn't going to do that again and ordered up some ready made jumper cables to use next time. 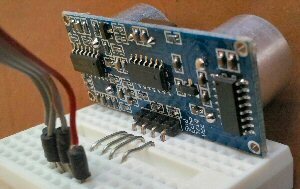 I used 4 solid wires to bridge the center gap in the breadboard and that's all you need to do. On the next page you can download the software that you need.